NEW YORK, Feb. 24, 2015 – Gaining the perfect water temperature in seconds is a comfort and convenience appreciated by all when turning on showers and filling bathtubs. If your bathroom is without an exposed thermostat, you may be kept waiting, testing the water and hoping to feel your desired temperature in the next few minutes. Thanks to the new range of exposed thermostats from GROHE, the world’s leading manufacturer and supplier of kitchen and bath fittings, the comfort and convenience of a perfect customized temperature is available to all. Each exposed thermostat is equipped with GROHE TurboStat® technology, which allows the water temperature to be adjusted accurately and instantly without wasting water while searching for your preferred temperature setting. GROHE has been perfecting their leading-edge thermostat technology since the early 1950s, and today in response to the growing need of a thermostat range that offers ideal temperature control, safety benefits and cost-effectiveness at any budget, GROHE has overhauled its range of entry-level thermostats. In doing so, they’ve taken the concept of a basic thermostat to a new level. The new entry-level range is led by the Grohtherm 1000 New. First introduced back in 1995, this model has since benefited from regular improvements. The Grohtherm 1000 New is designed with advanced technology and offers optimum functionality. It is equipped with GROHE CoolTouch® technology; a newly developed insulating ring keeps the hot water away from the thermostat body, thereby preventing its surface from heating up. The temperature control handle also features a SafeStop button, which the user needs to press in order to turn the water temperature up to more than 38 degrees Celsius. This button protects children and elderly people, in particular, from inadvertently turning up the temperature and then getting scalded. Intuitive use of the controls is also aided by the self-explanatory symbols. In addition, its volume control handle is equipped with an EcoButton, which allows users to reduce the consumption of shower water by up to 50 percent. The volume control handle of the bath thermostat features the AquadimmerEco mechanism for smooth and economical switching between bath filling and showering mode. “The organically flowing lines of Grohtherm 1000 New blend smoothly into any bathroom decor and coordinate perfectly with numerous GROHE shower heads and faucets,” notes Cheryl Dixon, Head of Brand and Trade Marketing for GROHE America. 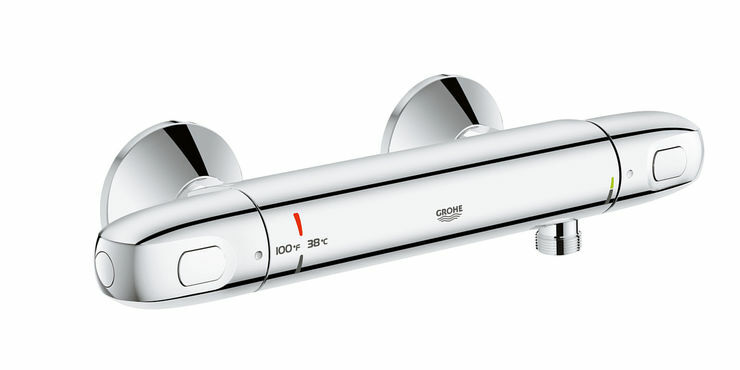 Rounding out the range is Grohtherm 2000, which boasts additional features: GROHE EasyReach™ storage and XL Waterfall. GROHE CoolTouch® technology is also included. The EasyReach™ tray can be placed onto the wall rosettes, closing the gap between the thermostat and the wall. The even surface conceals the connections, making the thermostat another smart design element. The XL Waterfall is inspired by nature and the natural flow of water. The expansive spout emerges seamlessly from the bathtub mixer and delivers a large, wide, laminar water flow, similar to a gently cascading waterfall. Whether you’re looking for a unique entry level-priced, highly functional thermostat or you’d like to take it one notch further with extras, thermostats from GROHE, complete with their wide variety of shower and bath systems, are on budget and on trend.